If a person is a hunter or an outdoorsman of another type, then one of the things he can collect is knives. Knives can be an interesting wall display or something to display in a case. In this buyer's guide, fixed blade knives will be explained and examined. The basics of collectible knife care will be also be explored. A list of common manufacturers within the realm of vintage fixed blade knives will also be provided. All this information will be given with an eye on using eBay as a collectible resource. There are two main types of knives: fixed blade and folding blade. A folding blade folds into the handle, while a fixed blade does not fold at all. Fixed blade knives are generally held in sheaths and are usually stronger and easier to clean than folding knives because they do not have moving parts. Because of their enhanced strength, fixed blade knives are often used in hunting. 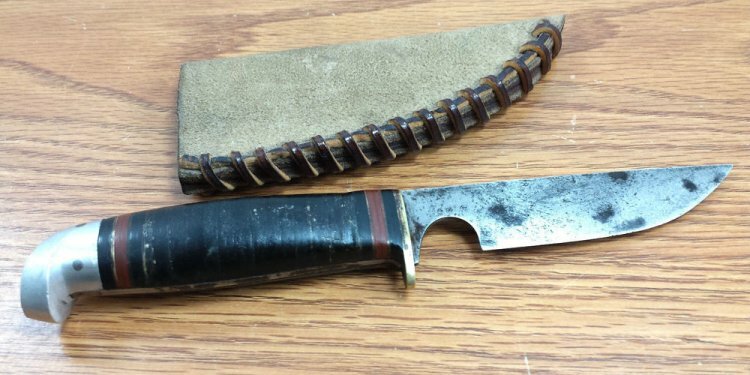 Here are a few other variables to consider when looking at vintage fixed blade knives. Knives are used for a variety of purposes and they have been customized for cutting, skinning, penetrating, and slicing. A normal blade has a flat back and a carving edge on the other side. The flat back allows the knife wielder to put extra force on the blade when cutting. Other common blades include drop - point, clip - point, and skinning knives. Drop-point blades are similar to normal blades, but have a curve on both sides of the tip. Clip-point blades have a hook at the tip that includes blades on both sides. Skinning knives have wide blades with a sharpened hook that will allow skinning without piercing the interior of what is being skinned. Most current blades are made of stainless steel, but vintage knives use almost any material that can be used to cut. Stainless steel, a term for an alloy of steel that contains at least 10.5 percent chromium, avoids corrosion and holds its sharpness well. In its modern form, stainless steel has been around since the beginning of the 20th century. Prior to that, knives were made from various alloys and other easily sharpened materials. Handles of fixed blade knives are produced using several materials and patterns. Handle materials include wood, plastic, leather, rubber, micarta, and stainless steel. Ceremonial knives can be made of stone, bone, or animal horns or tusks. There are a variety of methods used to keep vintage knives from corroding or becoming damaged. One should coat his or her knives with oil to avoid moisture. Rubbing alcohol can be used to remove dirt and light scuffs, and rust removers can be used to remove built up rust. It is a good idea to use soft cotton cloths to rub away dust and fingerprints. Steel wool and sandpaper can be used to remove rust and pitting. While many collectors only display their knives, if the knives are used, they should be cleaned thoroughly after each use. Knives should be stored in a dry, cool place. Handles made of bone need to be rehydrated from time to time with either mineral oil or rubbing alcohol. Knives are generally considered vintage if they were produced prior to 1970, and can be either custom - made or factory manufactured. The following manufacturers are among the more popular in existence. This list is not meant to be exhaustive, but to give the collector a representative sample of the manufacturers of vintage fixed blade knives. Camillus started producing knives in the late 19th century. Many of the vintage Camillus knives available date back to World War II when the company produced more than 13 million knives for the allied forces, including the popular USMC 1219C2 combat knife. Camillus also produced machetes and pocket knives for servicemen, and continued to produce knives for the United States military in the Vietnam War. In the 1920s, Camillus produced a series of collectible knives that honored people including George Washington, Roy Rogers, and Babe Ruth. Most Camillus products can be found under the title of fighting knife and some are also called daggers. Many of the knives have a handle that is as long as the blade. Since 1939, Gerber Legendary Blades has been producing consumer knives. The company also produces multi-tools, axes, flashlights, and shovels. These knives include fighting knives, machetes, boot knives, and steak knives. The cutlery sometimes comes in a set with a walnut storage box. Gerber also produces serrated knives for cutting bread. The Gerber Mark II combat knife, first produced in 1967, is notable for its black anodized blade and a black sheath. The Imperial Knife Company was founded in 1916 and produced knives for the military. The company closed in 2004 after being consolidated with Schrade in 1985. Imperial knives used in World War II were 12 inches long with a seven-inch blade and were considered bayonet blades. The handle was comprised of grooved black rubber. Other vintage Imperial knives have handles made from antler and deer bone. Imperial hunting knives often come with a brown leather sheath.